"Good Artists Borrow, Great Artists Steal." And by that definition Romanian , Iani Papadopol, is the greatest artist who ever lived. His recent exhibition, "UpDae 3D loading" is a master class in fantasy landscape design. Or, more accurately, it's a master class in stealing concept art from popular videogames like Guild Wars 2 and World of Warcraft, printing it off, claiming it as your own and attempting to sell it. 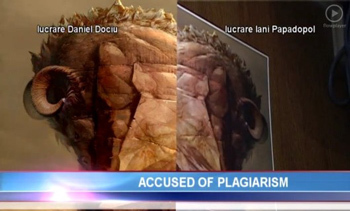 Papadopol's plagiarism went unnoticed until a local news crew, impressed by his masterful work, decided to broadcast the "artist" and his "art" on TV. Online fans promptly recognized artwork from top-tier industry illustrators like Arena Net's, Daniel Dociu and Blizzard's, Mathias Verhasselt. "I found out from my friends," said Dociu, a fellow Romanian, on a local news channel. "I recognized four pieces of my work immediately. What upsets me is that he's also Romanian with an artistic background. I will not take legal action if he admits what he did." Papadopol's father, who is apparently an acclaimed artist in his own right, claims the whole affair is a "misunderstanding." Unfortunately, his son seems to have a long history of knocking off other people's work. A blog he opened in 2009 contains a number of pilfered concept pieces which Iani fraudulently takes credit for.